My local Christmas Bird Count is this Saturday, so I’m hoping my team will be able to find Pine Grosbeaks. I haven’t seen any yet this winter — so fingers crossed! 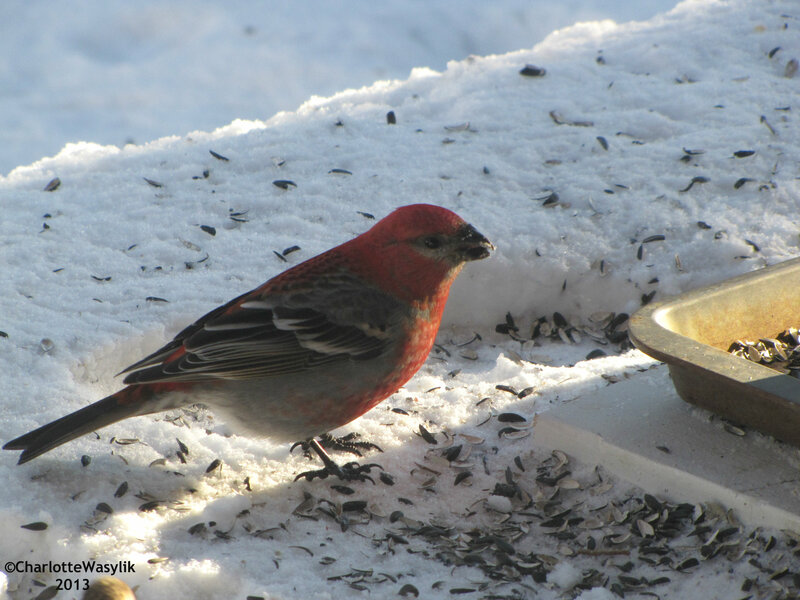 This entry was posted in Alberta Birds, Birding, Blogging, Canada Birds, Feathers on Friday, Feeding Birds, General Birding, Nature, Photography, Winter and tagged Feathers on Friday, Pine Grosbeak. Bookmark the permalink. We are going to a bird count tomorrow also at Oak Hammock Marsh. I haven’t seen any Pine Grosbeaks yet either. I have seen one or two redpolls but not any other than that. Hope you see some of those grosbeaks on the bird count. Here’s my post – a reminder of summer! That’s a lovely Pine Grosbeak, Charlotte. I have never seen one in the wild. Here’s my sub,is soon for this week, it’s the second part of a series. Here’s Part 3 of the breat blue heron story in case you’re curious how it ended. What a great visitor, lucky you. I would love to see a Pine Grosbeak! Happy Weekend!